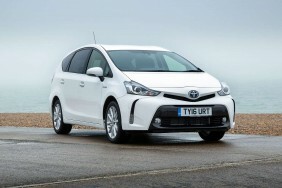 Great Toyota Prius+ car Leasing & Contract Hire Deals. Our Toyota Prius+ Lease Deals. The Prius+ cannot succeed without offering compelling cost of ownership figures. The novelty has well and truly worn off hybrid cars, to the extent that they're now judged by the same tough criteria as petrol and diesel models. So how does it stack up? Not badly at all actually. We've already seen that the upfront pricing is fair and early concerns about Prius battery durability have been shown to be completely unfounded by the legions of 300,000 mile private hire vehicles still running without a murmur. As a result, used demand is strong for any Prius family vehicle. Day to day running costs are also nailed right down. In normal use, the Icon model will return 68.9 mpg while the bigger wheels of the Excel take the edge off that a smidgeon, that car getting 64.2mpg. Emissions are rated at 96g/km for the Icon and 101 for the Excel, which may be key in the buying decision as it means the two cars are in different tax bands and only the T4 is exempt from the London congestion charge. In this current model, the dashboard infotainment screen also displays the Hybrid System Indicator and Energy monitor - features common to all Toyota hybrids. Plus it provides a clever ""Eco Judge"" function, designed to help the driver maximise the powertrain's efficiency, giving a points score for their eco-driving style.